Congratulations! You've been doing your homework. Our puppies are very special to us, so as responsible breeders, we do our homework too. We require each prospective buyer to complete an application form which is used to help us make the best matches between our puppies and their new homes. All puppies are sold with a contract that includes a limited health warrantee as well a a non- breeding agreement unless otherwise arranged. 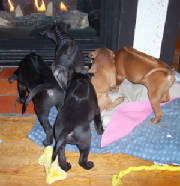 Thank you for you interest in Si Dang Thai Kennels Thai Ridgeback puppies. This questionnaire is intended to assist in correctly matching the puppy to their new homes and to be sure that prospective puppy buyers have completely considered all the aspects of owning a Thai Ridgeback puppy. Our goal is a happy home for puppy and family for a lifetime. How did you find Si Dang Thai Kennels? Red, Blue, Black or Fawn? 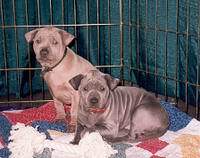 Why are you interested in getting a Thai Ridgeback puppy? Be specific please. Are you aware of their temperaments, describe please. Are you aware of their medical problems, if any, describe please. Are you planning to do any competition or performance activities? If so, what? Have you ever had a dog before? What kind(s)? Where did you get it (them)? What happened to it(them) if you don't still have it(them)? What other breeders have you contacted? Are you on any other waiting lists? Which ones? puppy will be living and sleeping. home during the day, or if not, what are your plans to arrange for mid-day care for your puppy? Please provide 2 references - name, address, city, state, zip, phone and/or e-mail. A deposit of $ 500.00 Canadian is required which is refundable only if I cannot provide you with a puppy. A receipt is provided. Copyright © 2004 Si Dang Thai Kennels. All Rights Reserved.